Every year from July 7 to 14 at 8 a.m sharp, six bulls run through the streets of Pamplona, Spain, chasing about two thousand people. This run, which usually lasts three minutes or less and ends with a report of injuries and an occasional death, has achieved worldwide fame for what some consider pure insanity, and it’s hard to argue with that. But the run is only a small part of the festivities for Saint Fermin, known in Spain as the Sanfermines: religious processions, children’s activities, music, dancing, and a fireworks contest. 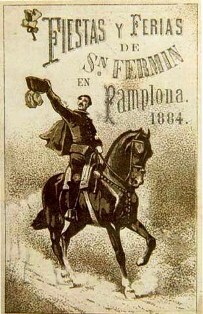 It all started before the 1100s with religious activities on October 10 in Pamplona to honor Saint Fermin, one of the patron saints of the kingdom of Navarra. By the 1200s, the city was also celebrating a fair on the night of Saint John the Baptist, June 23 and 24, or sometimes on Saint Peter’s day, June 29. Like medieval fairs depicted in movies, there was a marketplace and entertainment that attracted crowds, but even more important was the sale of livestock. And, being Spanish, the fair ended with a bullfight, although in medieval times the bull was fought with lances by men on horseback, usually knights. In 1324, the Sanfermines lasted seven days, and in 1381, King Carlos II of Navarra granted it tax-free status. But that part of Spain is rainy in autumn, so in 1591 all the fairs were united into a single celebration that started on the seventh day of the seventh month – July 7 – to take advantage of sunny summer days. Despite the date change, it was still called the San Fermin fiesta. The 1591 festival opened with a ceremonial proclamation, a pregón. (Fiestas in Spain still often open with a pregón.) A tournament with lances was held in the main square, and a theater presentation dramatized the “Comedy and Tragedy of the Blessed Saint Fermin.” Dancing and religious processions in the streets occurred throughout the fiesta, and goods and livestock were bought and sold. And there was a bullfight in the main square. These medieval and Renaissance bullfights were the origin of the running with the bulls. At that time, the run was called the entrada (entrance) because the bulls entered from pastures outside of town and were herded to the corral at the main square at dawn. Just as today, the bulls were led by steers who knew the route, but in those days the bulls were followed by people on horseback or on foot, shouting and waving staffs. In 1776, the first fencing was built along the route. Sometime in the 1800s, people began to run in front of the bulls, a custom that continues today in Pamplona and in many other cities and towns in Spain. In 1856, the event became known as the encierro (enclosure), which is still the word in Spanish for a running of the bulls. The first rules for the running were created by the municipality in 1867. The first montón (pileup) was documented in 1878, one of the most feared accidents in a running of the bulls: someone in the frantic rush ahead of the bulls trips and falls. Another runner trips and falls on him. Then, in the haste and panic, more runners fall until they form a pile. If it blocks the entrance to the bullring, the result is terror: the bulls are on their way and cannot be stopped. A pileup occurred in Pamplona on July 13, 2013. Although no one died, some people were injured as the bulls and steers tried to push through until, finally, the animals were guided away behind a fence at the side of the ring. The pileup starts 2 minutes into this video. The Sanfermines remained relatively unknown until Ernest Hemingway wrote about them in the novel The Sun Also Rises in 1926. In the 1950s the fiesta became international, and despite the other festivities, the running of the bulls has overshadowed all else, at least to outside observers. A poll by the city in 2014 found that 56% of the runners came from other countries: 24% from the United States, 11% from Australia and New Zealand, 4% from Britain, 2.5% from France, and 2.5% from South America. Only 8% were from Pamplona, 6% from Navarra Province, and 30% from other parts of Spain. A total of 17,126 runners participated during the 2014 Sanfermines. On July 13 alone, 2,924 runners ran ahead of the bulls – but on every day of the run, most runners start so far ahead of the bulls that they are in the bullring and have leaped up into the seats, ready for the post-run entertainment, long before the bulls are halfway there. All this has turned a what was a local medieval fair to swap livestock and say some prayers into a modern international festival. The city of Pamplona has 190,000 inhabitants, but more than a million people now come for the Sanfermines. And although it may seem hard to believe, they do a lot more than just run with the bulls.